It was definitely a very hot day (approx. 35° C), and a day with many matches for every team that competed. 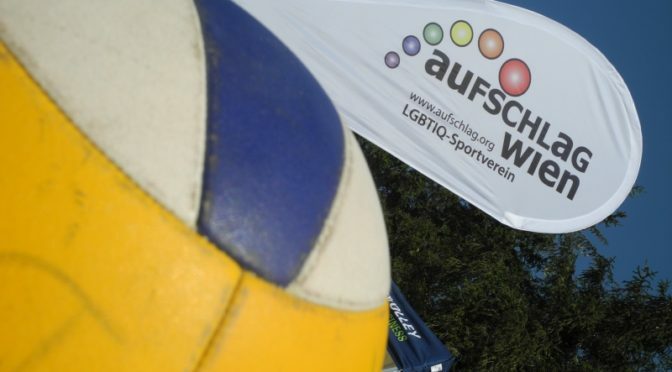 On 26th August, the Vienna Beach Trophy 2017, one of the largest LGBTIQ beach volleyball tournaments in Europe, took place on seven courts in Vienna. Despite the heat, the 25 teams in four different levels fought hard for each and every point. There was time to relax immediately after the tournament at a barbecue. A great tournament day ended with the Vienna Beach Trophy Closing Party that was held at “Why Not”. In almost all levels, teams from Prague performed particularly well. In A, the highest level, team „Winnie the Pooh“ (Michal and Radim, both Czech Republic) beat the Austro-German team „Oops we hit it again“ (Manuel and Stefan). In B+, all three medal ranks were dominated by teams from Czech Republic, „Danny and Mike“ (Daniel and Michal) made the gold medal. In B-, „The Fattiest“ (Petr/Czech Republic and The Tuan, Vietnam) were also the best. In C, the team “How I Set Your Mother” (Tom and Nghia, both from Germany) made the first place. The VBT 2018 will take place on 25 August 2018. See you there!